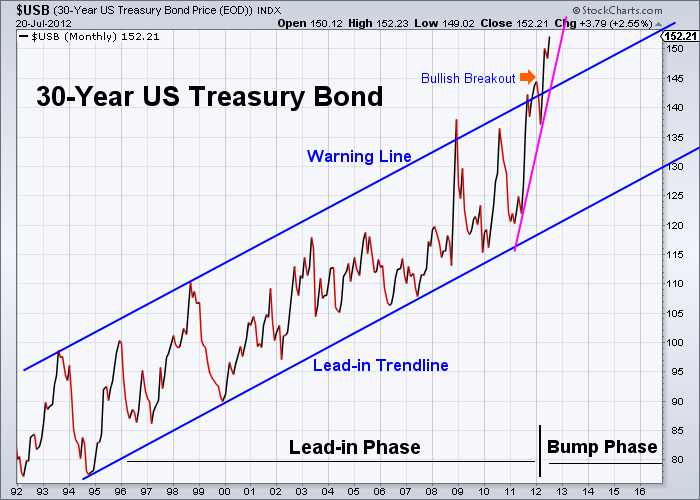 With relative bullish strengths of the US treasury bonds, US dollar, and US stock market, the broad markets are choppy and are waiting for the next breakout. 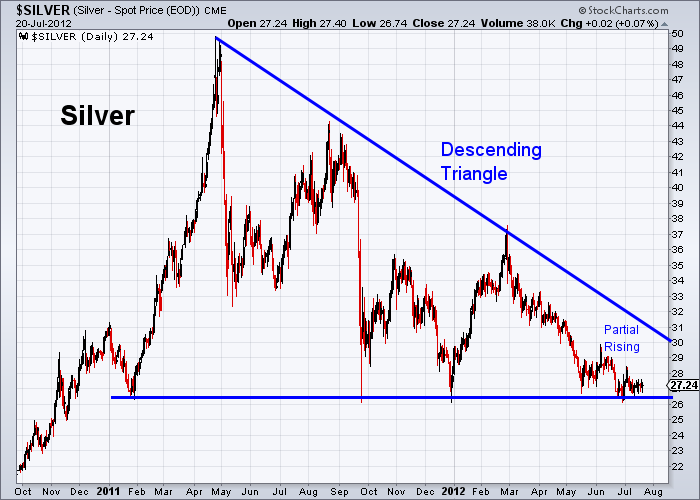 The Chinese stock market, gold, and silver are all in similar descending triangle patterns and wait for the next breakout, as well. 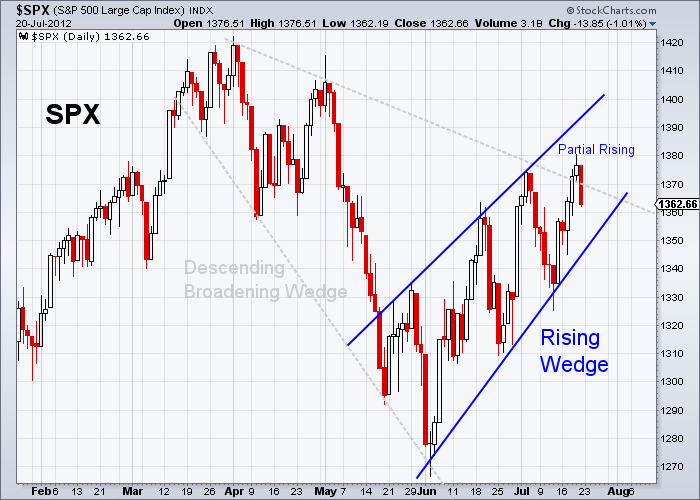 Inside the 15-week Descending Broadening Wedge formation, the S&P 500 index is forming an 8-week Rising Wedge pattern. Price movement has been choppy between two converging boundaries of the rising wedge; the market has flipped almost every 5 trading days. However, the last up-swing did not reach the upper boundary of the rising wedge and formed a Partial Rise inside, that is a bearish sign for an immediate downward breakout from the lower boundary of the rising wedge. Meanwhile, the SPX is also testing the upper boundary of the 15-week Descending Broadening Wedge confined by two gray dotted lines on the following chart. If prices decisively break above the upper boundary of the broadening wedge, the broad market could become very bullish and the SPX could advance to the level of the previous high at 1420. Based on above analyses of both the 8-week rising wedge and the 15-week broadening wedge patterns, the possibilities for an upside or a downside breakout exist. Watch out for the breakout direction. 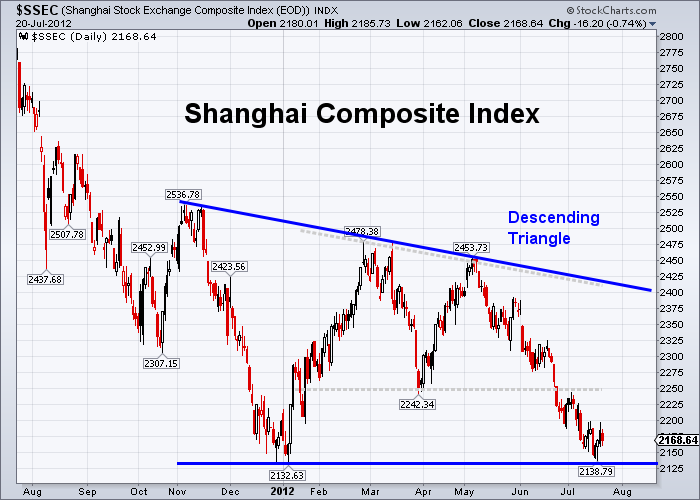 The Shanghai Composite Index has stayed below the horizontal line of the 5-month Descending Triangle pattern. 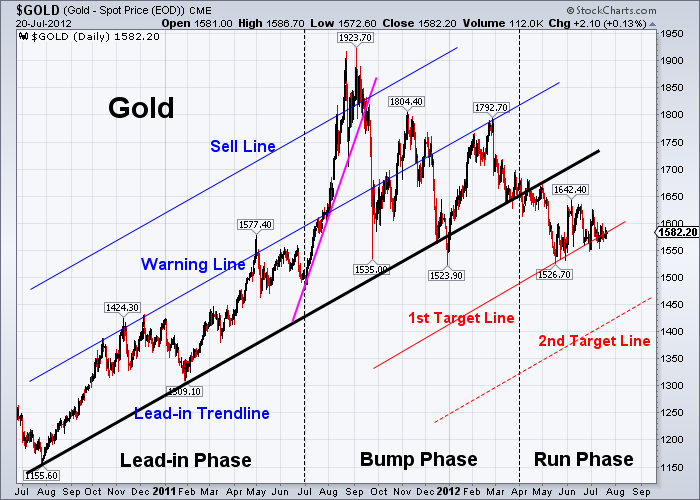 The downside price target of 2146 was reached last week. Now the Chinese stock market is forming a larger scale, 9-month Descending Triangle pattern. Prices should bounce inside the triangle before the next breakout. 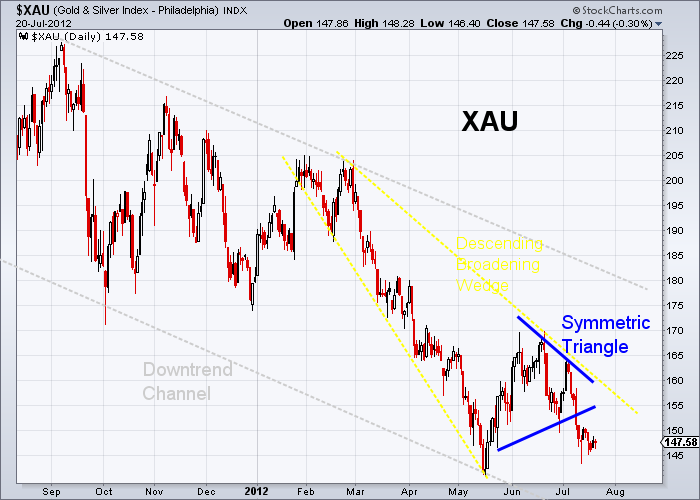 Both XAU and HUI have been in a 10-month Downtrend Channel and a 5-month Descending Broadening Wedge. 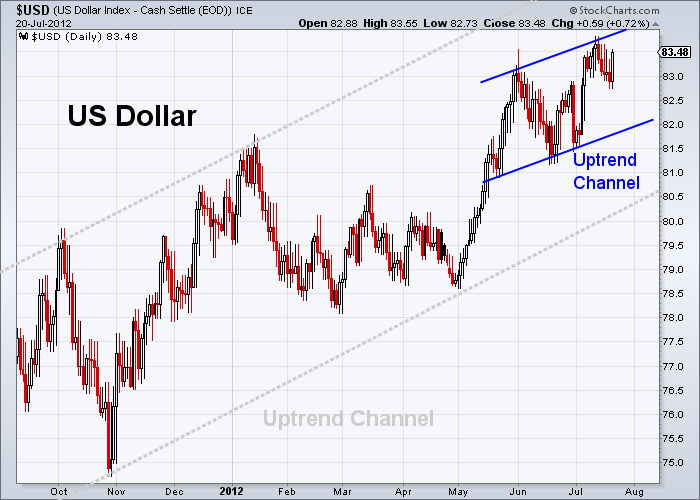 Also they broke to the downside of a 5-week short-term Symmetrical Triangle pattern. 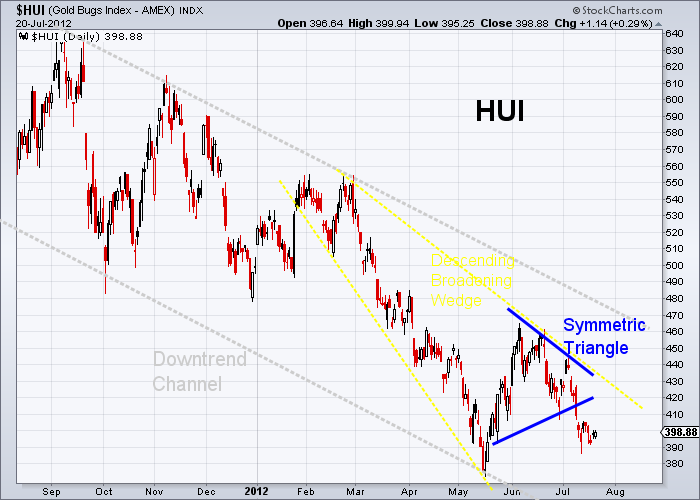 According to Bulkowski’s measure rule, the downside price targets are projected at 142 for XAU and 386 for HUI. 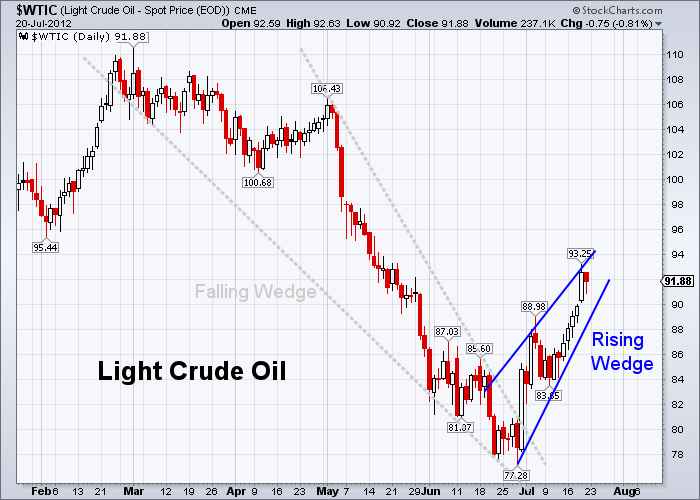 The post-breakout of a four-month Falling Wedge pattern pushed the crude oil price higher and formed a 3-week Rising Wedge pattern. 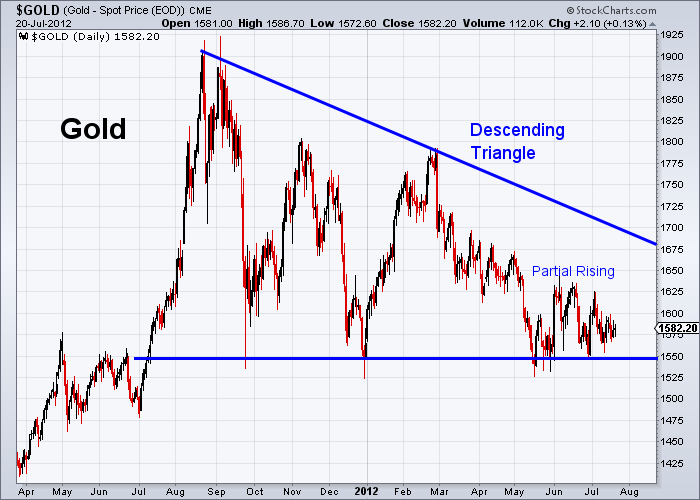 Watch out for the breakout direction from the rising wedge. The following table is the percentage change of sectors and major market indexes against the 89-day exponential moving average (EMA89). 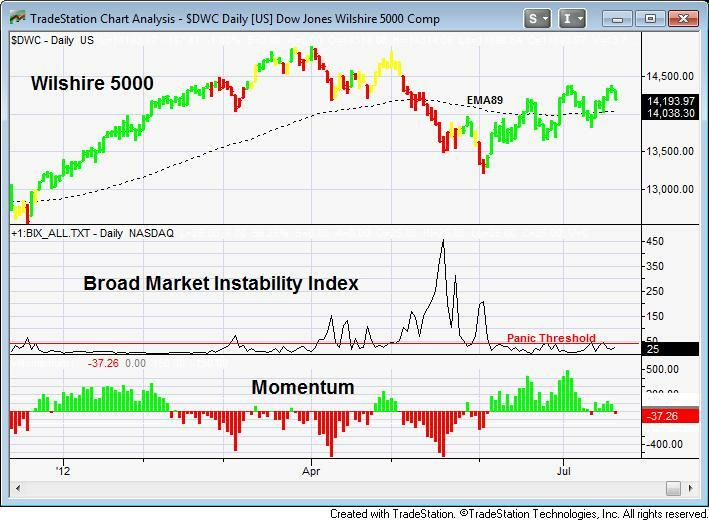 The Dow Jones Wilshire 5000 index, as an average or a benchmark of the total market, is 1.11% above the EMA89. 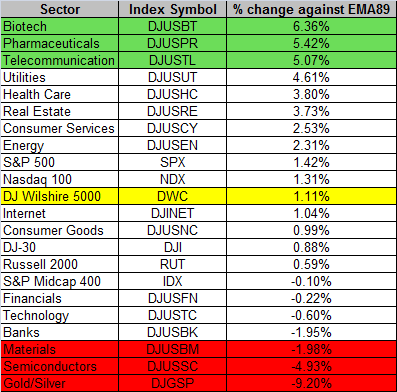 Outperforming sectors are Biotech (6.36%), Pharmaceuticals (5.42%), and Telecommunication (5.07%). Underperforming sectors are Precious Metals (-9.20%), Semiconductors (-4.93%), and Basic Materials (-1.98%). The S&P 500 (1.42%) is outperforming the market, and the S&P 400 Mid-cap (-0.10%) is underperforming.